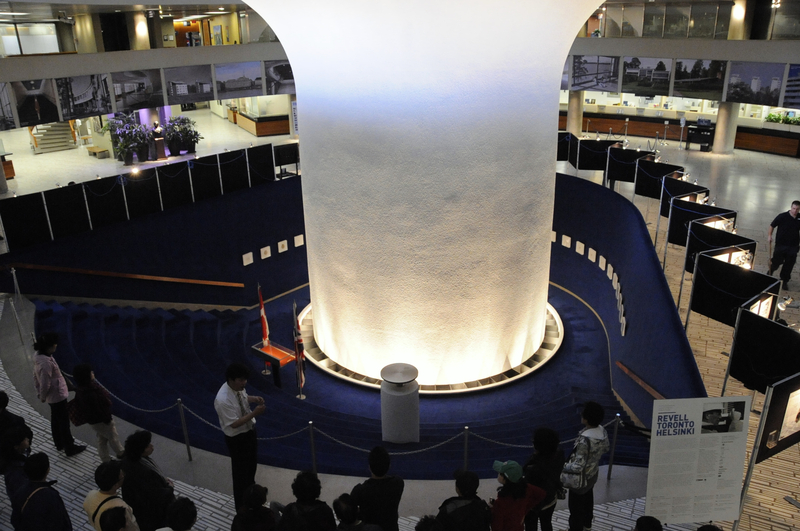 There are several self-guided tours to help you get acquainted with Toronto City Hall. Toronto City Hall is the seat of municipal government and corporate head office for Canada’s largest city. It consists of two office towers. The East Tower has 27 floors; the West Tower, 20. Nestled between the two towers is the Council Chamber where Toronto City Council holds its monthly meetings. The remainder of the public areas at City Hall are located on the first and second floors. The offices of the Mayor and the 25 City Councillors are on the second floor. The upper floors of the two towers contain office space for City staff, who provide a wide variety of municipal services to the people of Toronto. Among the staff located at City Hall are the City Manager and the department heads. Offices for additional staff are located at Metro Hall, at five civic centres, and at a number of other City facilities. Download the self-guided tour booklet. In 1998, seven former municipalities (the Borough of East York, the City of Etobicoke, the City of North York, the City of Scarborough, the original City of Toronto, the City of York and the Regional Municipality of Metropolitan Toronto) were amalgamated to form one new city to be called the City of Toronto. 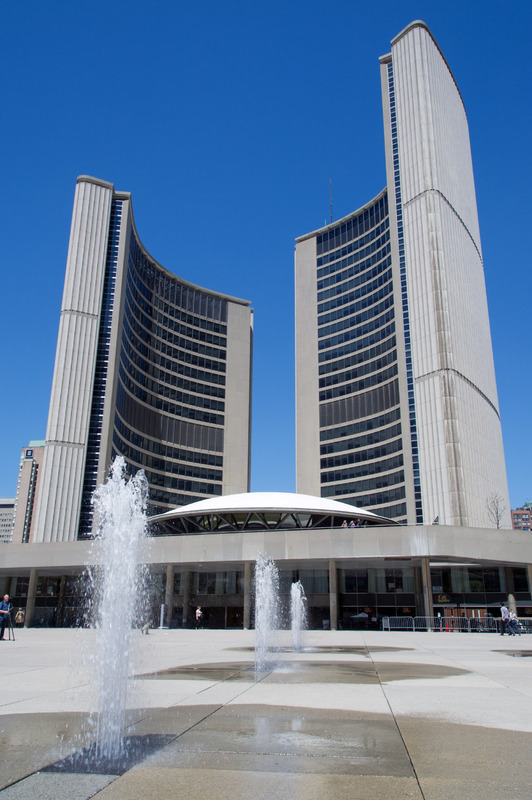 Following amalgamation, the City Council for the much enlarged City of Toronto affirmed Toronto City Hall as the seat of the new municipal government. Over the years, the original City of Toronto had a total of four City Halls. From the time of the City’s incorporation in 1834 until early in 1845, the Council met in a building in a Market Complex at the intersection of King and Jarvis Streets. It was a plain orange-red brick building in the Georgian style, designed by James Cooper. The building was eventually destroyed by fire in 1849. St. Lawrence Hall stands on the site today. From 1845 to 1899, the seat of City government was located at Front and Jarvis Streets, in the South St. Lawrence Market. The City’s Market Gallery now occupies the 19th century City Council Chamber on the second floor of the Market. Toronto’s third City Hall, on the northeast corner of Queen and Bay Streets, was officially opened on September 18, 1899, by the mayor of the day, John Shaw. The building contained a Council Chamber, courtrooms and municipal offices. Old City Hall, as it is now usually known, was designed by Toronto architect Edward James Lennox whose later projects included Casa Loma and the King Edward Hotel. 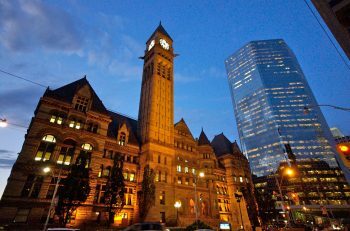 When Toronto’s fourth City Hall opened across Bay Street in 1965, Old City Hall became a Provincial courthouse. In 1957, then Mayor Nathan Phillips convinced City Council to hold an international design competition for a new City Hall on the northwest corner of Queen and Bay. A total of 520 designs were received from 42 different countries. The winner of the competition was Finnish architect, Viljo Revell. Because Mr. Revell was not registered as an architect in Canada, the Canadian firm John B. Parkin Associates assisted him with the City Hall project. Successors to that company still act as consultants on important architectural issues affecting the building. Viljo Revell’s design was divided into three main parts: the podium, the convex circular council chamber and two office towers of differing heights. The entire City Hall complex had a sculptural quality that would make it a striking landmark and ideal symbol of a growing city. Construction commenced on November 7, 1961, and the building was opened on September 13, 1965 by Governor General Georges Vanier. The final cost of the new City Hall was approximately $31 million. Tragically, Viljo Revell died of a heart attack 10 months prior to the opening ceremonies. He was 54. One of the most popular attractions at Toronto City Hall is the nail mural located on the east wall near the main entrance. This mural, called Metropolis, was the winning entry in an art competition held in 1974 to select a permanent work of art to complement City Hall’s unique architectural style. Metropolis was installed in 1977. The artist is David Partridge. Originally from Akron, Ohio, Mr. Partridge came to Canada in 1944. He studied at the University of Toronto, and also at Queen’s University in Kingston, Ontario. Created by local artists Brian Kipping and John McKinnon, Views to the City was the winner of a public art competition held by the City of Toronto in 1987. It was installed in City Hall in 1988. Brian Kipping crafted copper and glass mosaic tiles to present a rooftop panoramic view to the east and west from the roof of City Hall. The “west” wall shows Lake Ontario, the Sunnyside Pavilion and, in the distance, Port Credit. A crane on the “east” side of the mural belongs to the 1960s, when Toronto City Hall was under construction. John McKinnon is a sculptor and furniture designer. He created copper, three-dimensional life-size architectural pieces that refer to the rooftops of buildings that were in existence in 19th century Toronto. On the west wall, a pediment recalls part of the old City Hall, a spire from St. George the Martyr Church in Grange Park and a cornice that was borrowed from the past to make a comfortable bench. On the east wall there is a cupola and another cornice. 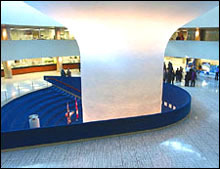 Visitors entering City Hall from Nathan Phillips Square walk directly into a large and distinctive rotunda. The floor is made of Carrara marble imported from Italy, cut in Canada and laid by hand. In the middle of the rotunda, a massive, reinforced concrete column, measuring six metres across, one metre thick, and goes down 16 metres into the bedrock beneath the building’s foundation, supports the 4,000 tonne Council Chamber above. The core of the column is actually hollow. It contains electrical cables, plumbing, and heating and air-conditioning equipment that service the Council Chamber. The Hall of Memory is located at the base of the column. A few steps below grade, there is a glass book case containing the “Golden Book of Remembrance”, inscribed with the names of 3,500 Torontonians who died during World War II. Two flags flank the display case: one, the Canadian flag; the other, the Union Jack (included because Canada is a member of the British Commonwealth). White plaques on the wall bear the insignia of Canadian Armed Forces units that have been headquartered in Toronto since 1793. Part way down the short staircase, positioned in the actual centre of City Hall, is a cylinder containing a leaden time capsule. Inside the time capsule are municipal handbooks, coins, stamps and the three daily newspapers printed on the day of City Hall’s dedication: November 7, 1962. A scale model of the HMCS Toronto, a Canadian naval frigate, is on display beneath the banners. Along the east wall of the rotunda, just inside the front door, is artist David Partridge’s Metropolis, a mural made entirely of nails. The name of City Hall architect Viljo Revell has been etched into a large support column just opposite Metropolis. Mr. Revell passed away not long before the construction of Toronto City Hall was completed. A scale model of the area of Toronto bordered by Dufferin Street to the west, Bloor to the north, the Don River valley and west edge of Riverdale to the east, and Lake Ontario to the south is on view on the west side of rotunda near the front door. 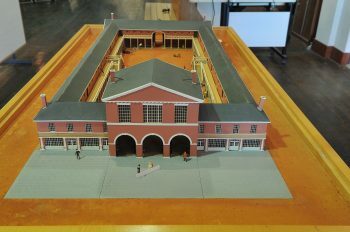 The scale model has been designed in such a way that visitors can readily pick out historical buildings and key landmarks. They can also see where future development is planned. In the hallway on the way to the Café on the Square and the library is a Toronto Archives display of historic photographs. The second floor is the Executive Floor of City Hall. Several committee rooms and the offices of Mayor John Tory, the 44 City Councillors are arranged in a circle around a mezzanine that overlooks the rotunda below. Toronto City Council is the main governing and legislative body for the City. Many of the decisions made by City Council are based on preliminary work and discussions that take place in committee meetings held in the second floor committee rooms. The largest of these committee rooms is Committee Room 1, which is big enough to accommodate the entire 45-member City Council as well as a seating area for the public and the media. Committee Room 1 is also equipped with video cameras to permit broadcasting of meetings. The City of Toronto’s Coat of Arms hangs on the wall just outside the Mayor’s Office. In the adjacent reception area, the Mayor’s ceremonial chain of office is on public view in a glass display case. A striking mosaic, called Views to the City, is located in one of three reception areas for the Councillors’ Offices. It is the creation of Brian Kipping and John McKinnon, both residents of Toronto. When viewed from above, the Council Chamber, positioned between the two curved towers of City Hall, resembles an eye between two eyelids. It is 46 metres wide and 12 metres at its highest point. It is supported solely by a circular column below. The roof is supported by 23 pairs of v-shaped concrete struts located outside the windows. The ceiling, which weighs over 2,000 tonnes, was made by pouring concrete into a single plywood mould. It took 40 days for the concrete to dry. To absorb sound, the Council Chamber is carpeted and the ceiling is sprayed with a carpet fibre. Official meetings of Toronto City Council are held in the Council Chamber. Council meetings commence on the fourth Tuesday of each month and generally last for three days. Each day’s session runs from 9:30 a.m. to approximately 6 p.m. For more details, please check the schedule of Council meetings, available online. The general public is welcome to attend City Council meetings. The public seating gallery can accommodate as many as 250 people at any given time. Speakers installed in front of seats in the public gallery make it easy for the audience to follow the debate. When he is chairing a City Council meeting, the Mayor sits in the centre chair located directly below the City of Toronto logo. The 44 City Councillors occupy the horseshoe-shaped seating area facing him. Seating assignments for individual members of Council are determined by lot. The City Clerk, who provides administrative support for Council, sits with staff at a table in the middle of the horseshoe, directly in front of the Mayor. Commissioners (i.e., department heads) sit to the left and right of the Mayor. A seating area for the City Hall press is situated behind the public gallery at the back of the Council Chamber. The Members’ Lounge, located behind the Council Chamber, provides City Councillors with a place to hold informal discussions and is also used as a venue for official receptions. The Members’ Lounge overlooks Nathan Phillips Square and also provides an excellent view of the Podium Green Roof at Toronto City Hall. Its official name is Three-Way Piece No. 2, but most Torontonians know the large sculpture in Nathan Phillips Square as the Archer. Architect Viljo Revell asked British sculptor, Henry Moore, to design and create a statue that would complement the flowing lines of City Hall. The Archer is a 2.5 tonne bronze free-form statue that rests on a concrete base, surrounded by a floor of concrete embedded with stones. Although $100,000 had been set aside for a piece of artwork for Nathan Phillips Square, Moore’s abstract design created sufficient public controversy that it was initially not accepted by City Council. However, following the death of Viljo Revell, Mayor Phillip Givens undertook a campaign to raise the $100,000 needed to purchase the Archer through private donations. The Archer was installed in Nathan Phillips Square in 1966. 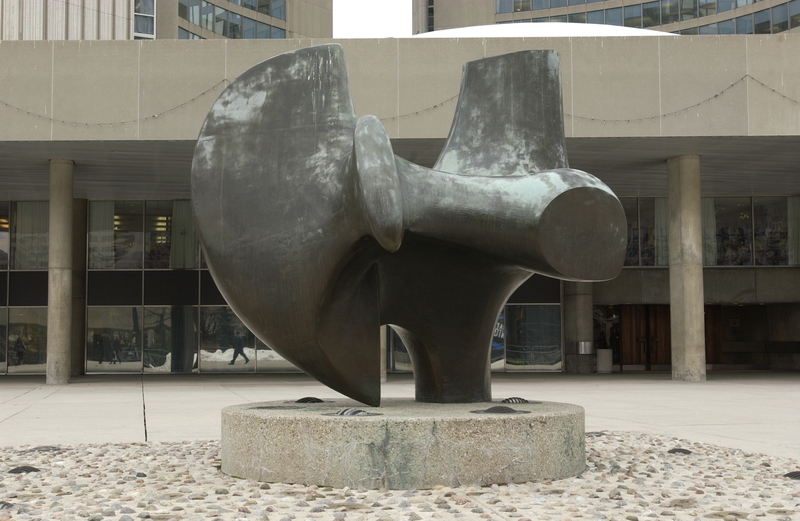 In 1974, Henry Moore donated 200 pieces of his artwork to the Art Gallery of Ontario in Toronto. They are on view in the Gallery’s Henry Moore Sculpture Centre. More information regarding Henry Moore may be found on the website of the Henry Moore Foundation.